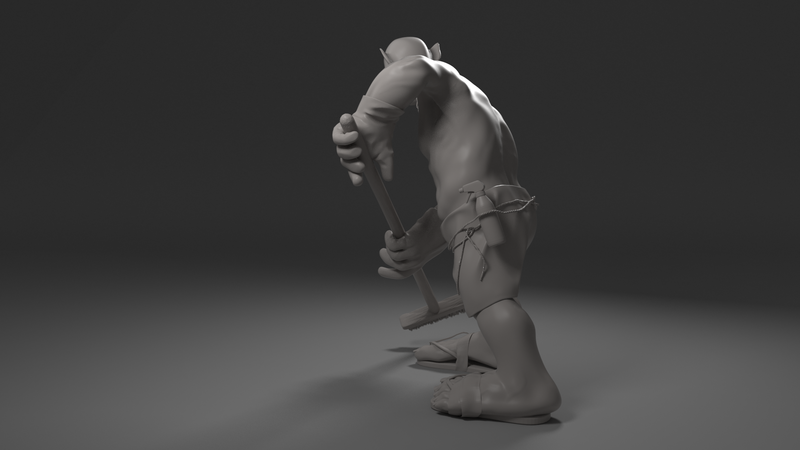 As part of my specialist project at university, I decided to do a full body character sculpt. 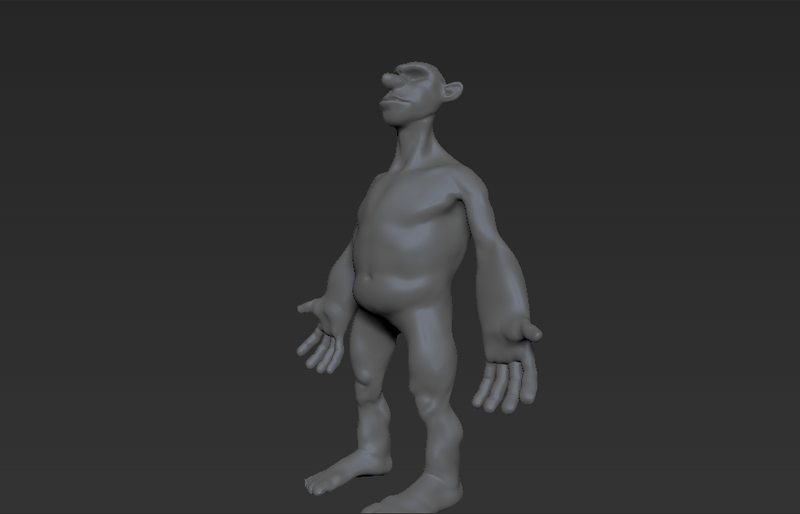 This involved character design, modelling, and sculpting. 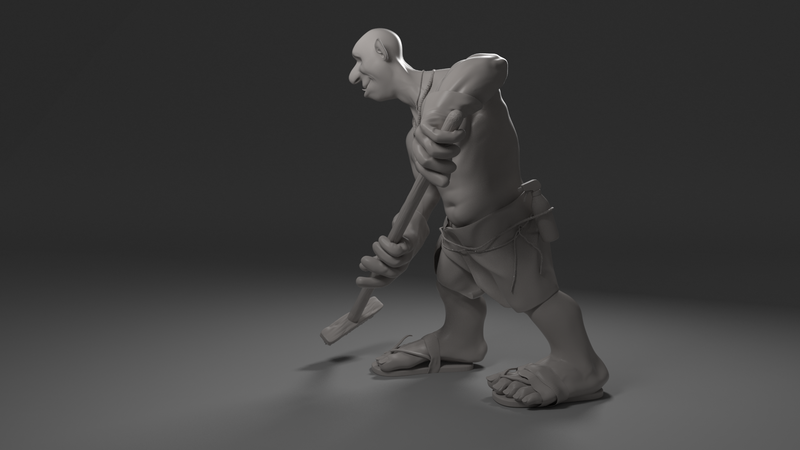 The aim was to create a character that was fun to make and look at. 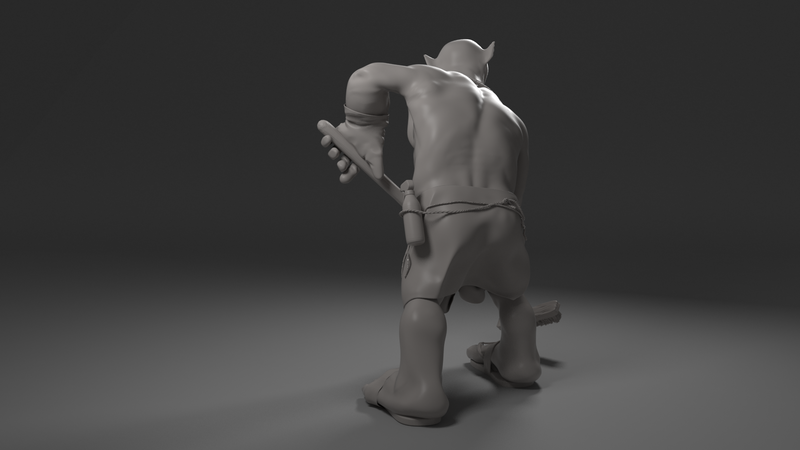 I didn’t want to make the generic muscly warrior, and instead try something different. 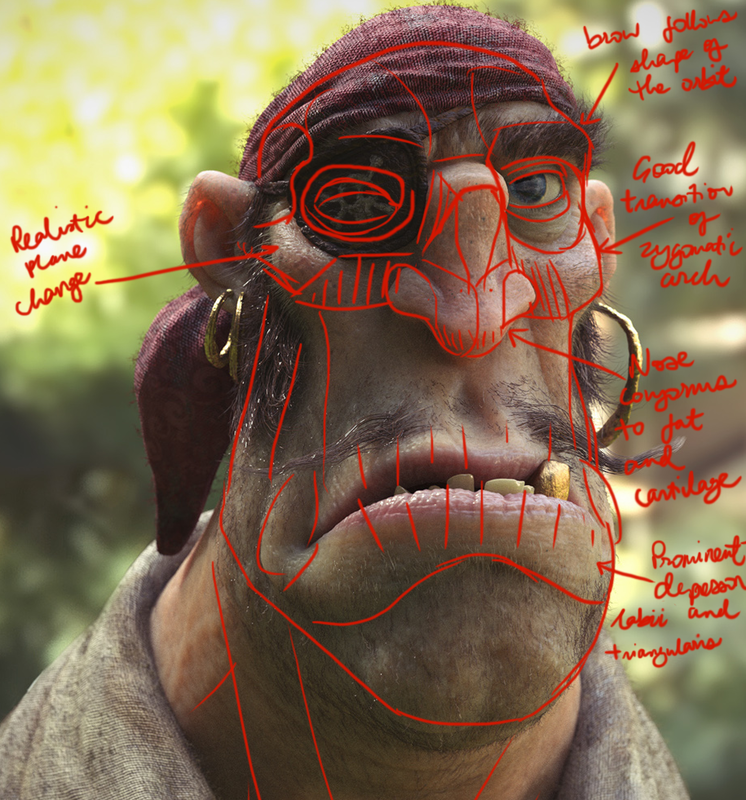 For inspiration I looked at the big players of digital character design; Pedro Conti, Vitorugo, Mike Azevedo, Even Amundsen, and Alexandre Diboine. To get the ideas going I brainstormed my character a few times, looking at setting, personality, aspirations, etc. I arrived at Gerald, the happy cleaner. 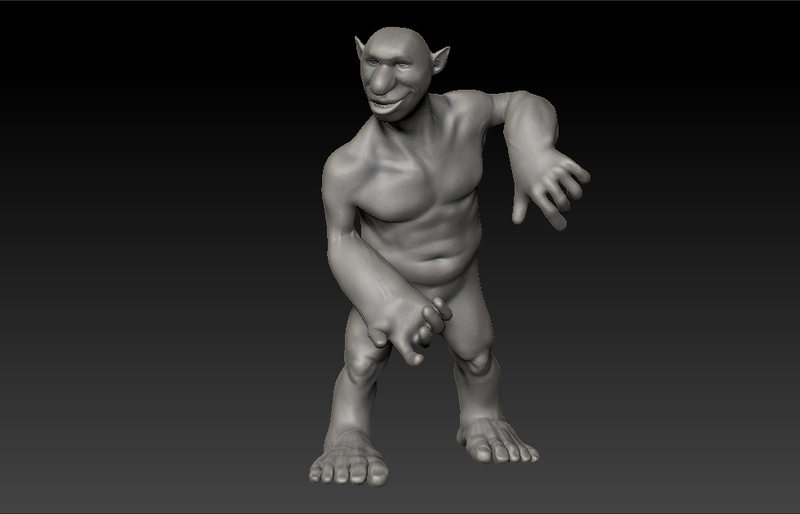 He’s an ogre and a bit of an outsider. 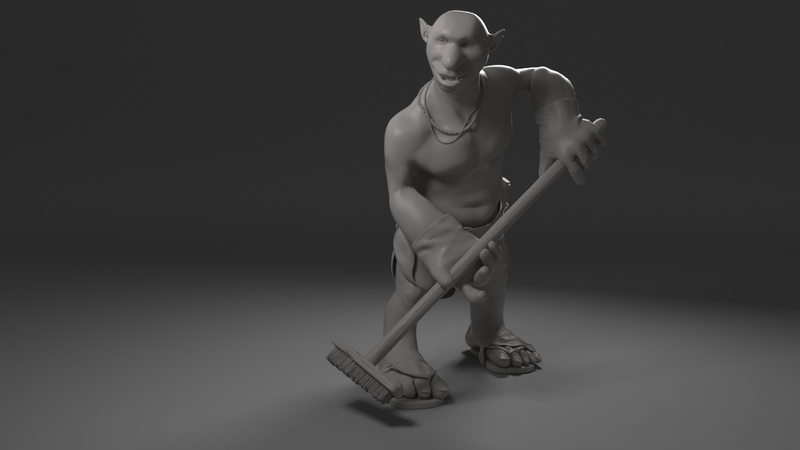 He likes to clean and make the world organised. He keeps his home under the bridge clean and sterilised. He isn’t quite so careful about his appearance, but that’s because he doesn’t have any mirrors! I tried to keep the design appealing, while retaining anatomical accuracy. 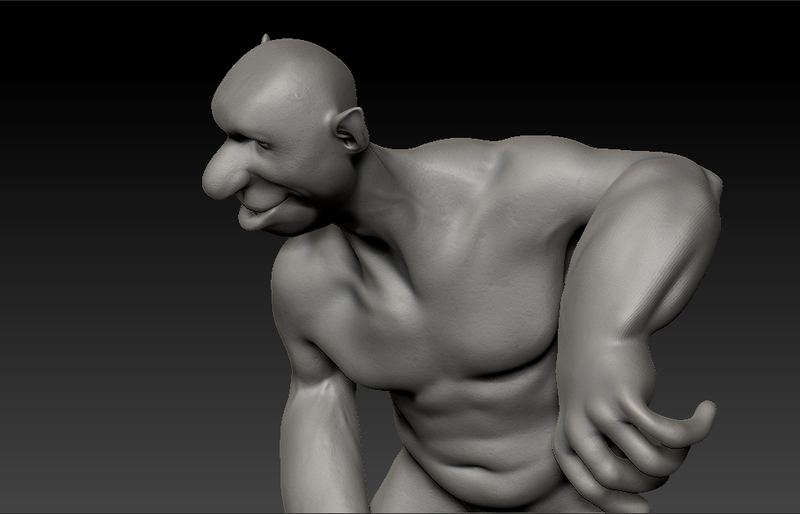 I wanted to use all the knowledge I’ve learnt from figure sculpting and apply it to something more stylised (than the constant ecorches). This is something that can be observed in good character sculpts. 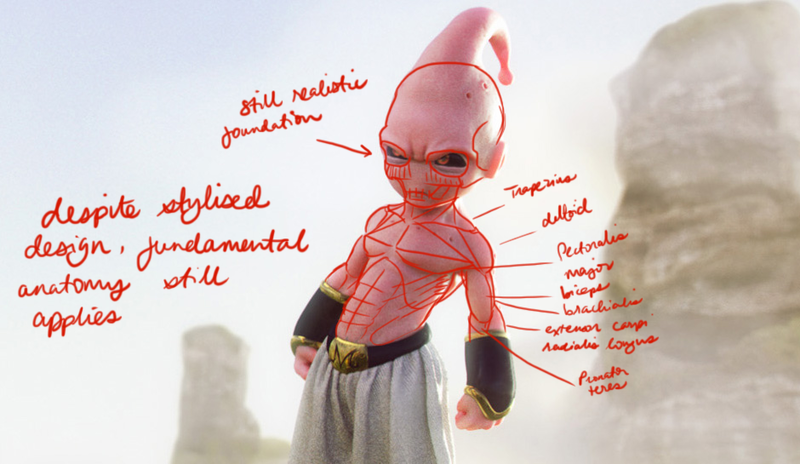 A quick paintover of Pedro Conti’s Pirate, and Vitorugo’s Buu demonstrates this. 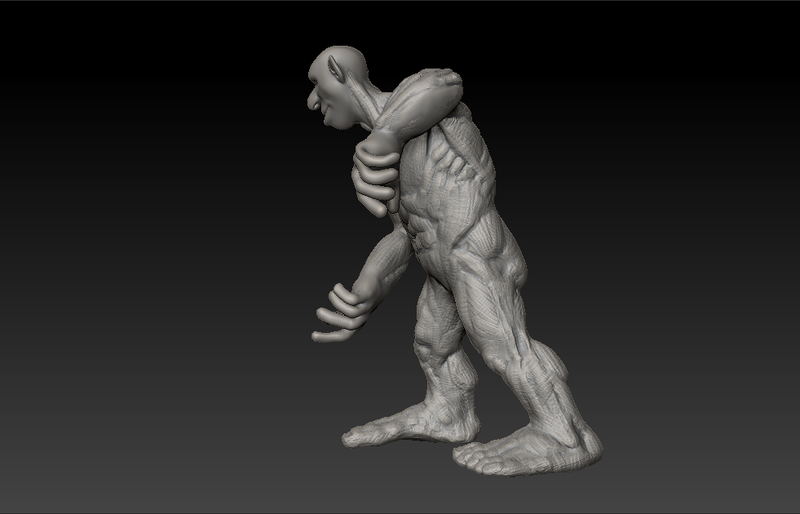 So with the initial pre-production done, I started sculpting. 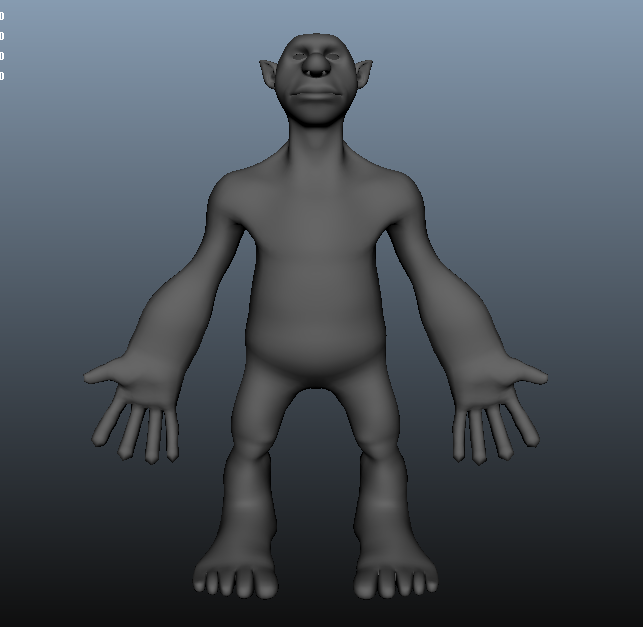 I like to outline the feeling and character of a character in the pre-production more than the physical properties. 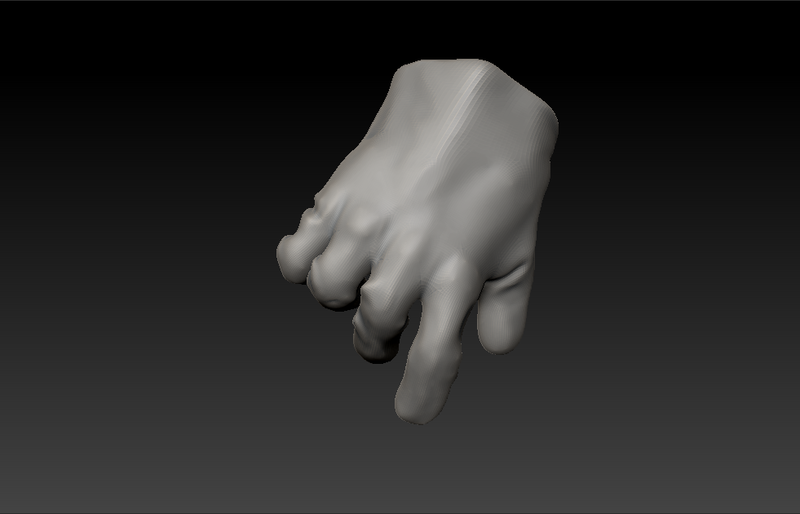 I then develop the idea further in Zbrush, where I can see the 3D forms and play around with them. 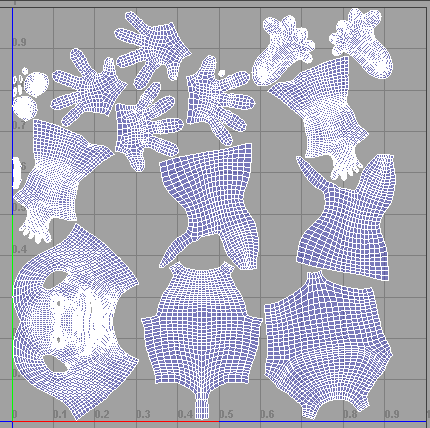 This was the blocking process, and purely for getting the main forms out there. I tried my hardest not to do any detailing (it was a struggle!). 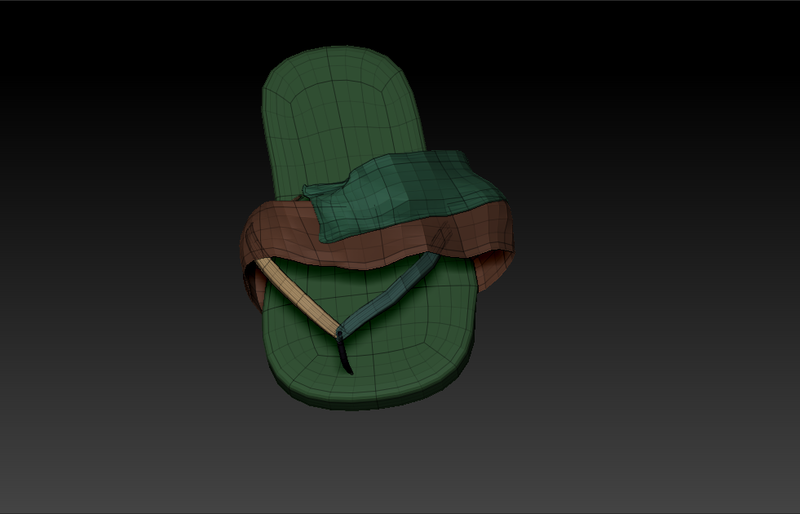 This is a quick process and after this I was ready for retopology. 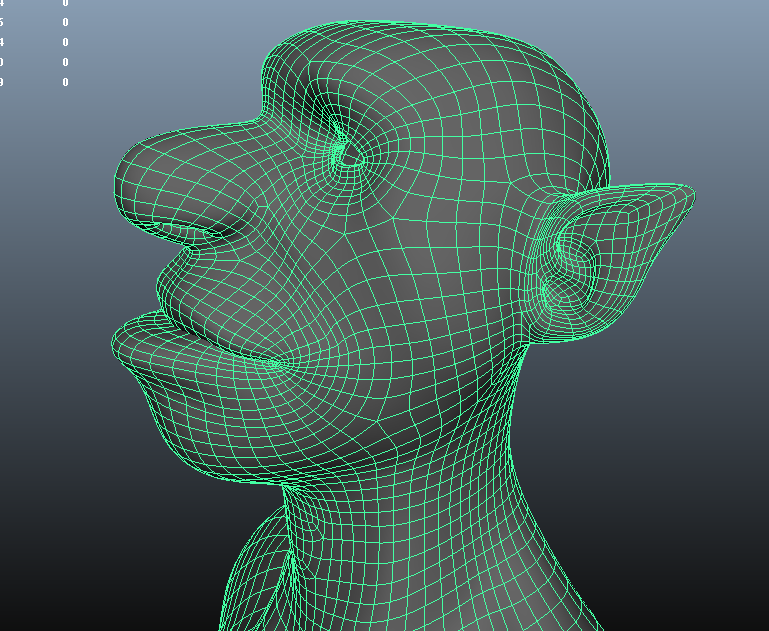 When retopologising I like to experiment with the most effective workflows. With this project especially I tried to learn as much as I could. I found a few interesting solutions. 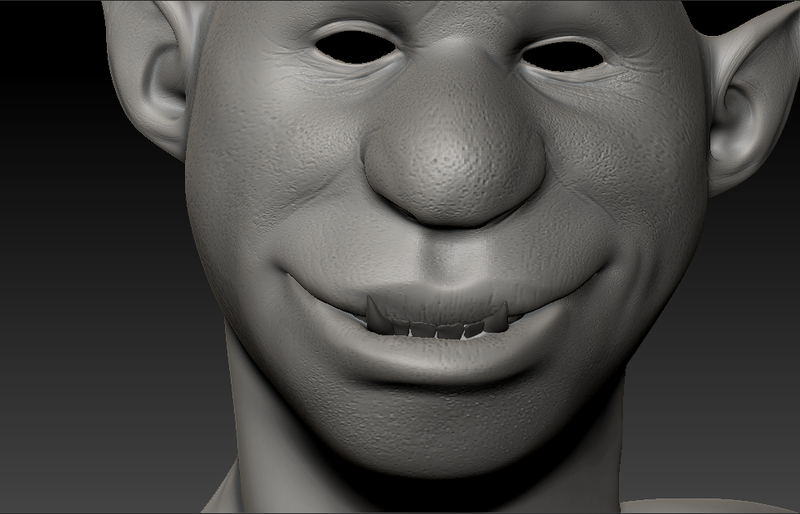 Zbrush’s topology brush proved very good for facial retopology, as it gave a lot of freedom by drawing curves straight onto the face and making quads by simply cross-hatching the curves. 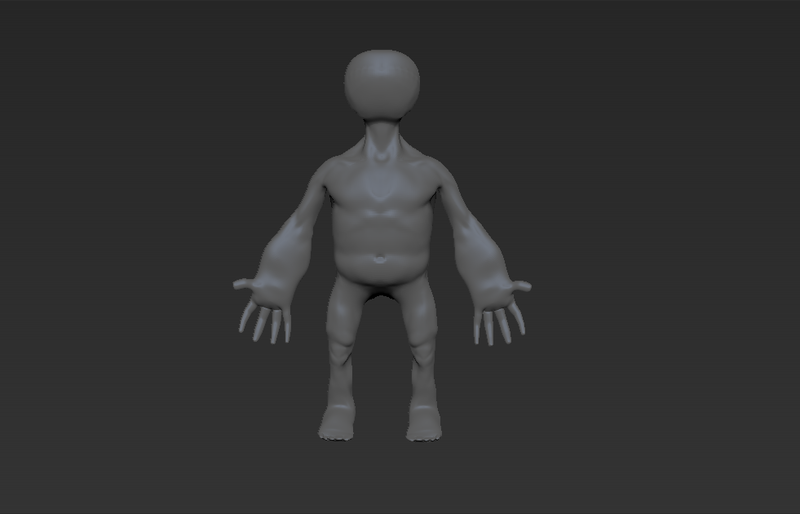 I used Maya 2014’s Modelling Toolkit for the body. 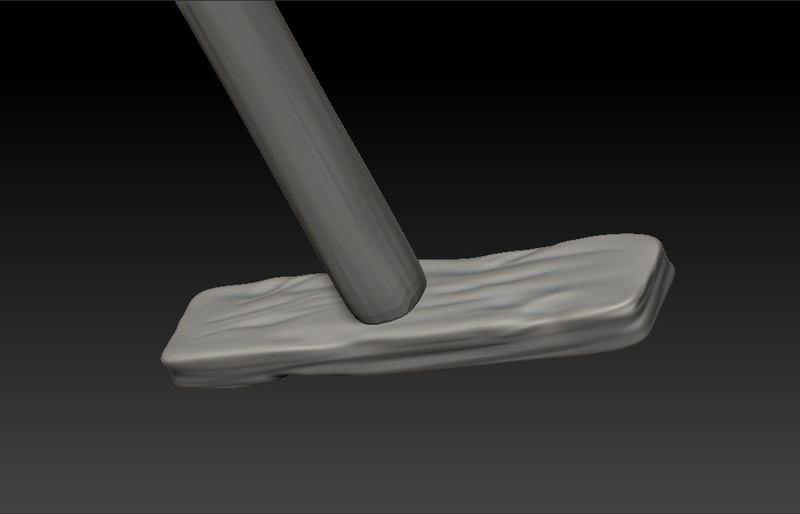 This was less free-flowing which suited the body as it needed to be more rigid and uniform. 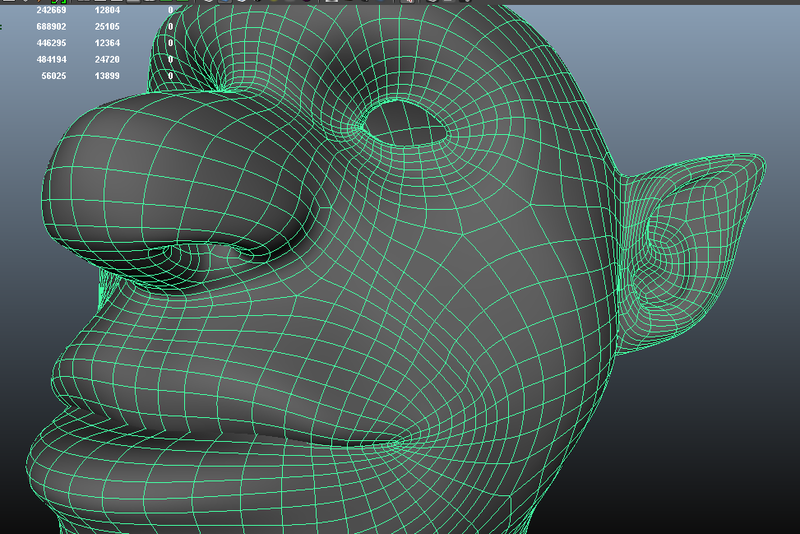 The ability to create easy edge loops helped a lot too. 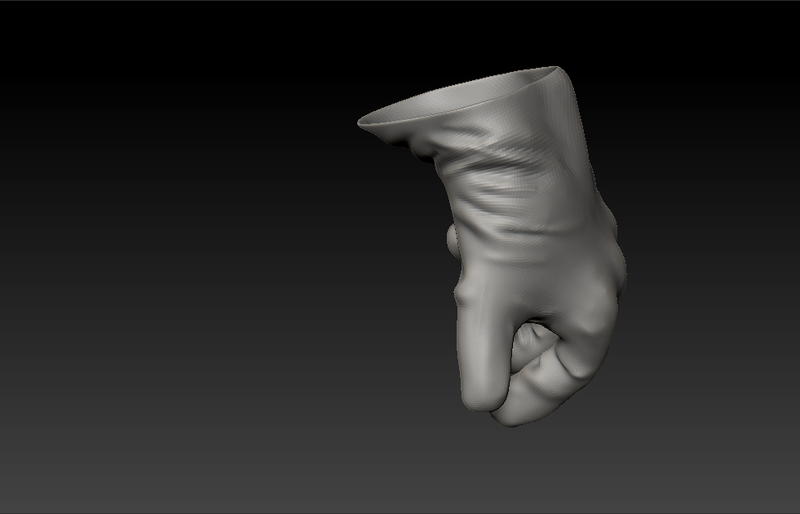 Finally, I used Russian 3D Scanner to retopologise the hand. 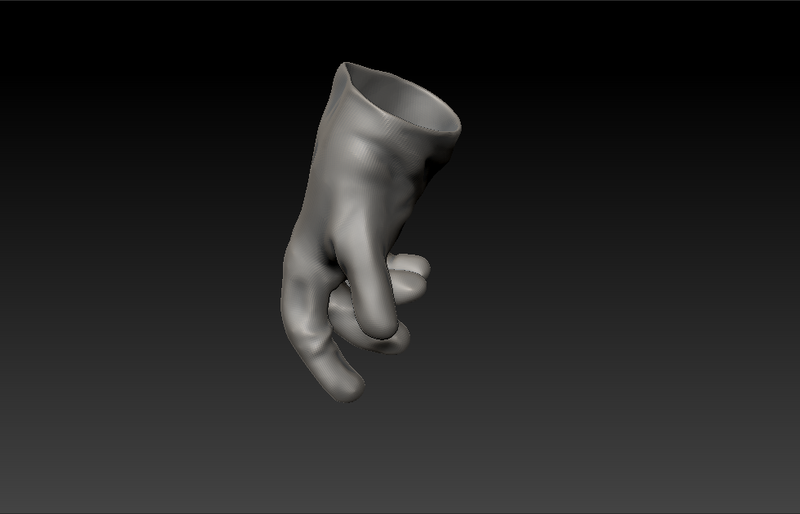 I modelled a generic hand basemesh in Maya, then wanted to see how well the software would wrap it around my high res sculpt. The results were very good. 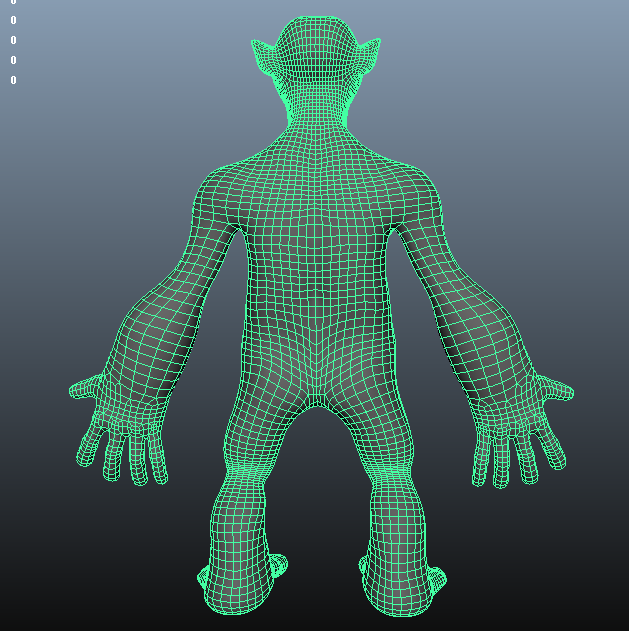 Here are some wireframes of the final topology! 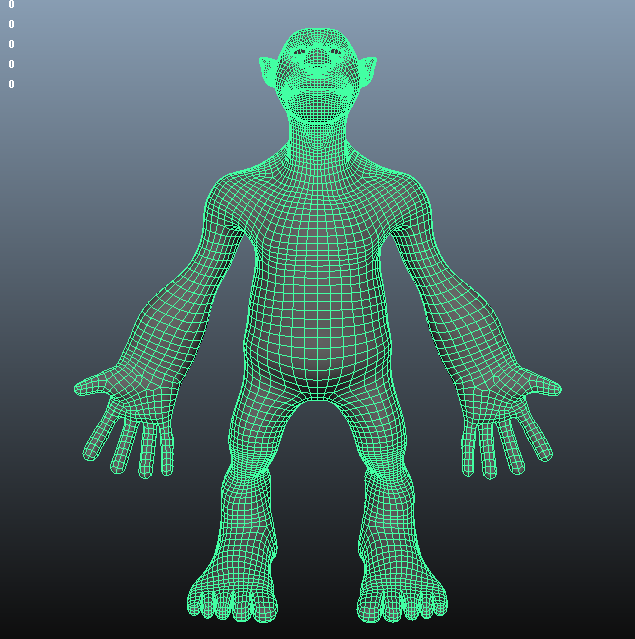 With the basemesh all done, it was time to UV unwrap so I could start sculpting the displacement maps. 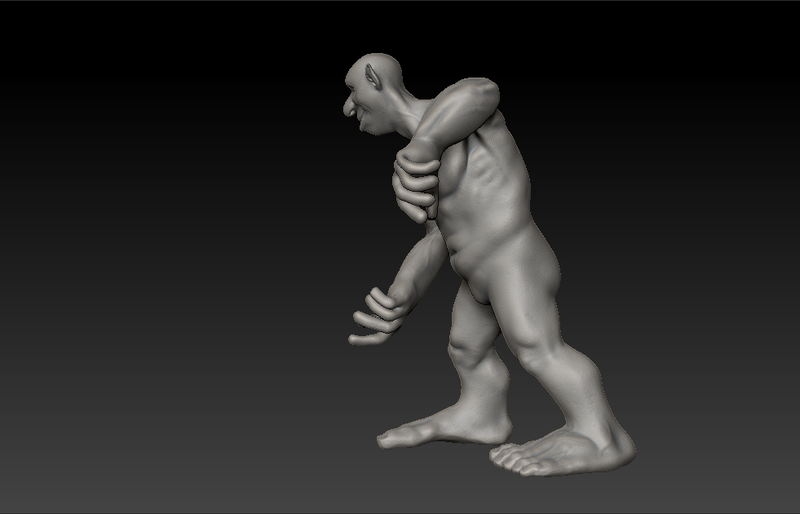 This was done using Unfold3d (standalone). This area is something I need to work on as I am not completely satisfied with the unwrapping as there is still some stretching (ears for example). It did the job though, so I proceeded further. 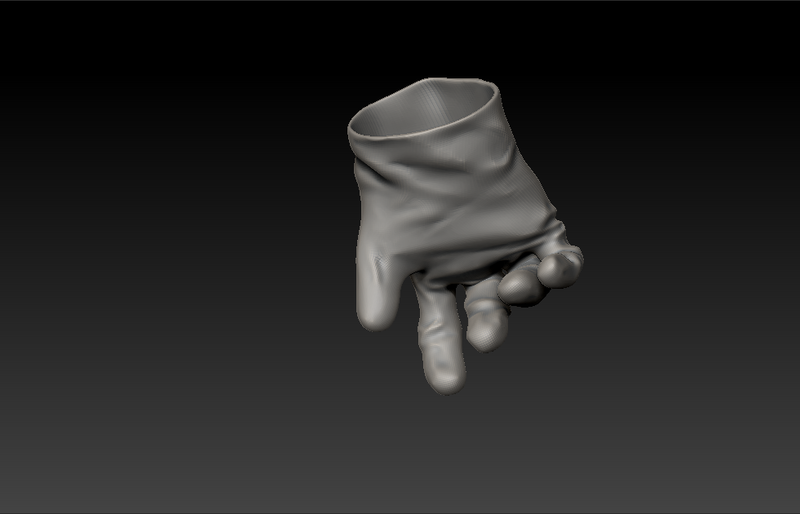 Once UV unwrapped, I was ready to start sculpting. 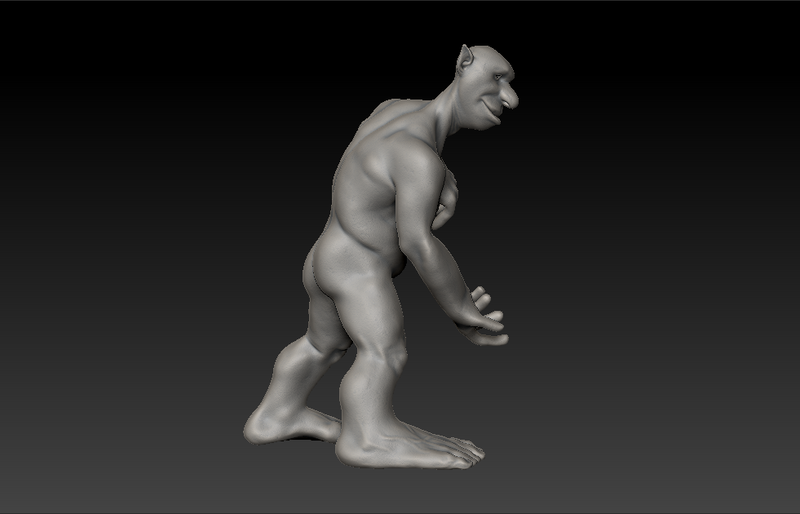 I discarded the old block sculpt, and imported the unwrapped, retopoed model into Zbrush. 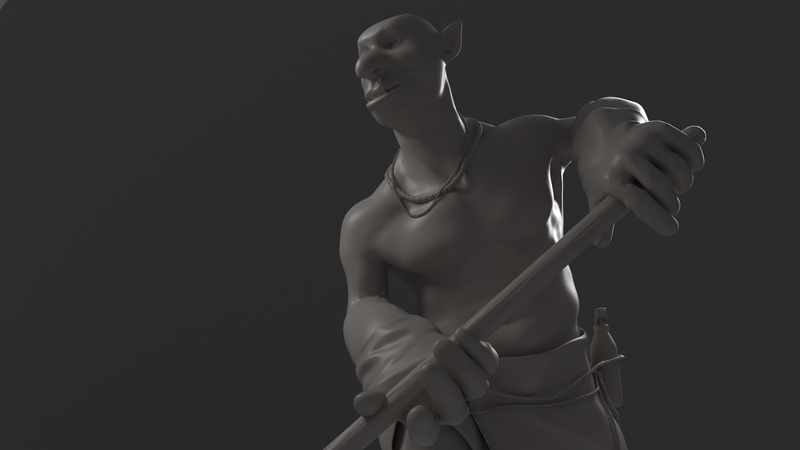 I started by posing him. I did this using the transpose tools. It was a simple process and it involved masking areas, then rotating or moving them. There was surprisingly little distortion and I had to cleanup a minimal amount. 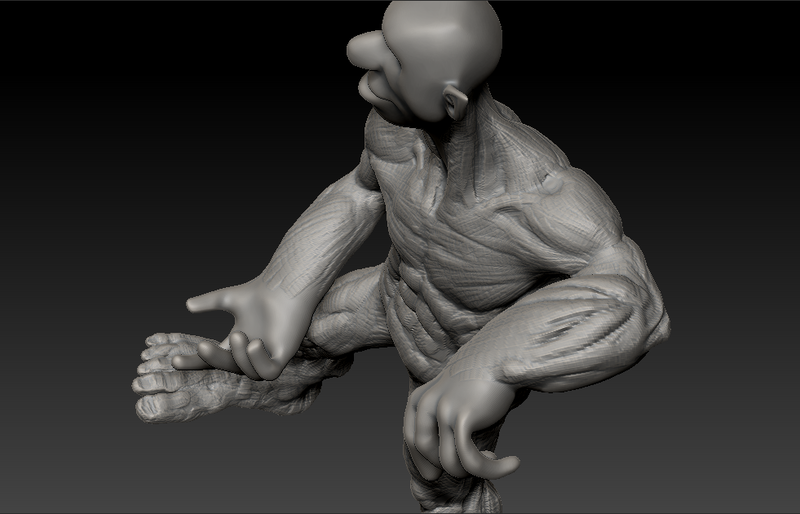 I also made sure to tense or relax muscle groups that were affected by the pose. 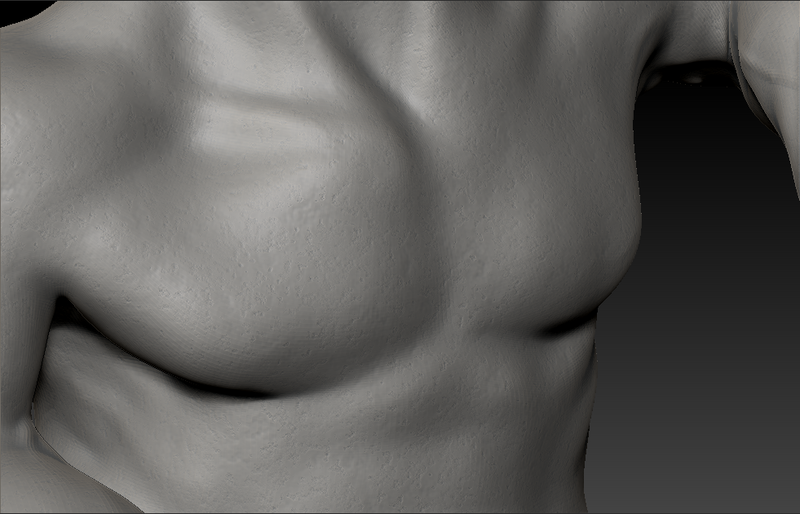 I then blocked in the anatomy pass. 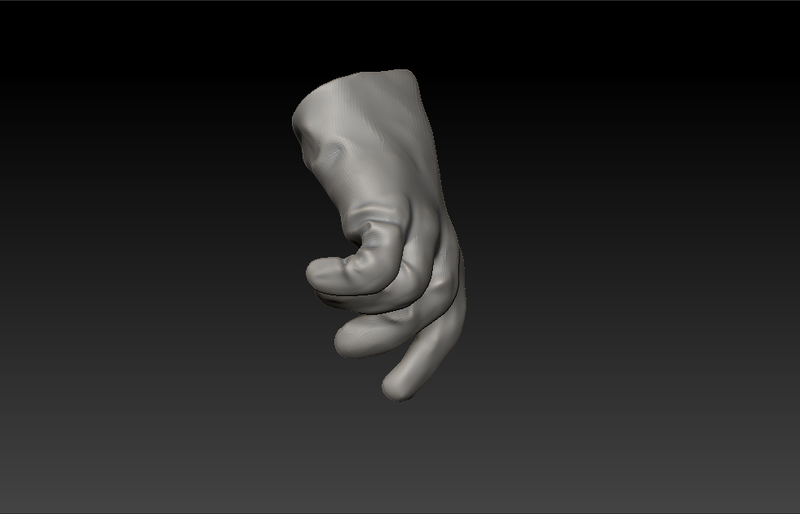 This was to create the foundation for the sculpt and was treated like an ecorche. This would provide very useful later on and in my opinion is generally good practice. With this done, it was time to cover up most of the work I’d done and put on the fat and skin. 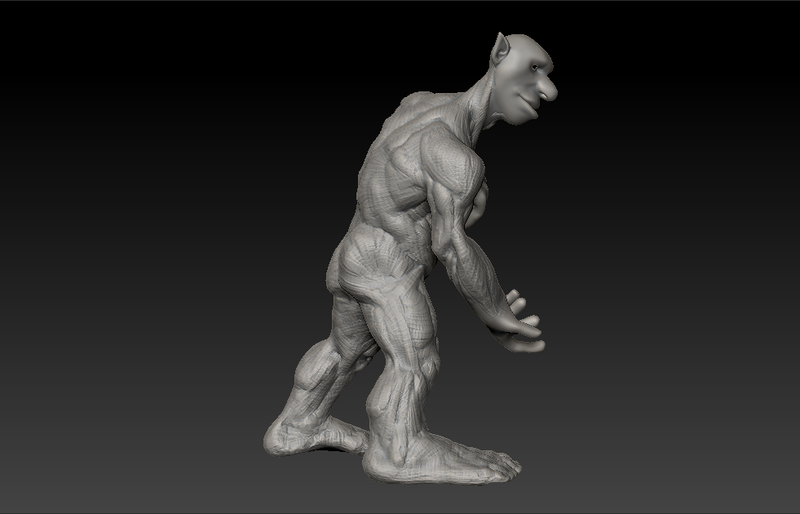 This process involved using the smooth directional brush, and clay tubes and standard brushes in Zbrush. I wanted Gerald to be a little chubby but also naturally built (as he’s an ogre and they have mad testosterone). He also likes to eat a lot of sardines and doesn’t do much cardio so the gut is there. 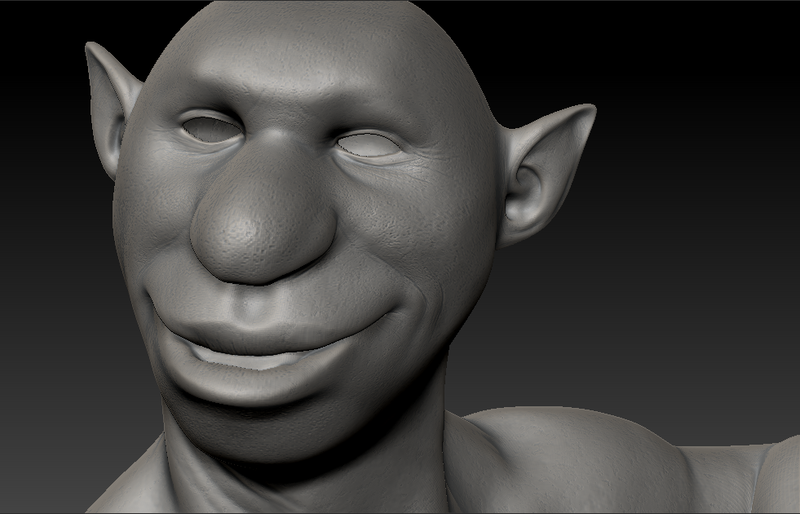 I also added some veins and skin pores (the body was done using NoiseMaker). He looks a little more natural now. 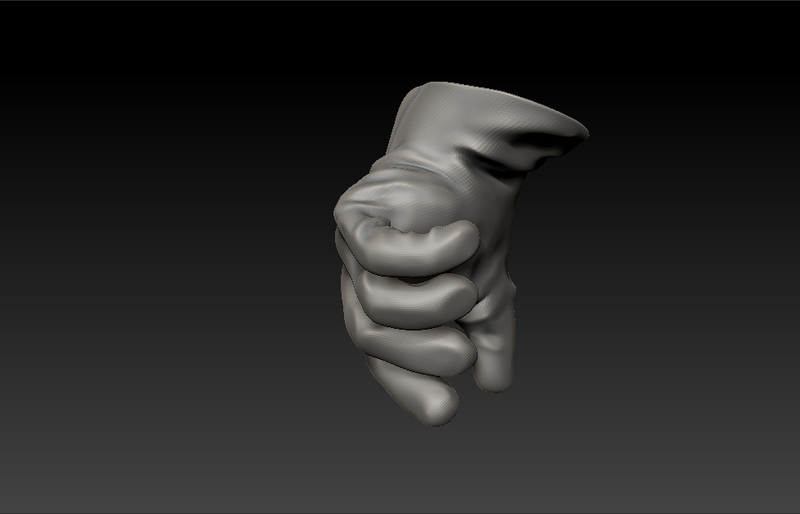 At this point I still hadn’t done the hands. 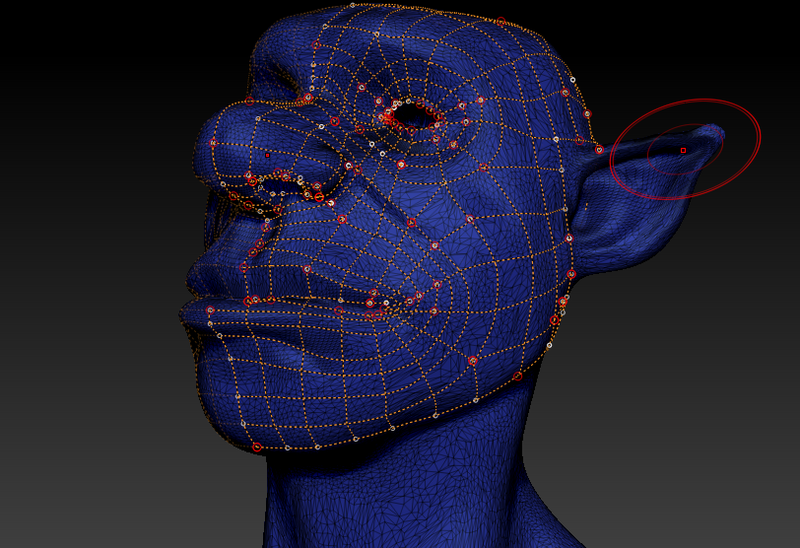 Using skin alphas on the standard brush I added in the facial skin pores. Once this was done it was time to start working on the props. I used a mixture of techniques to do this. 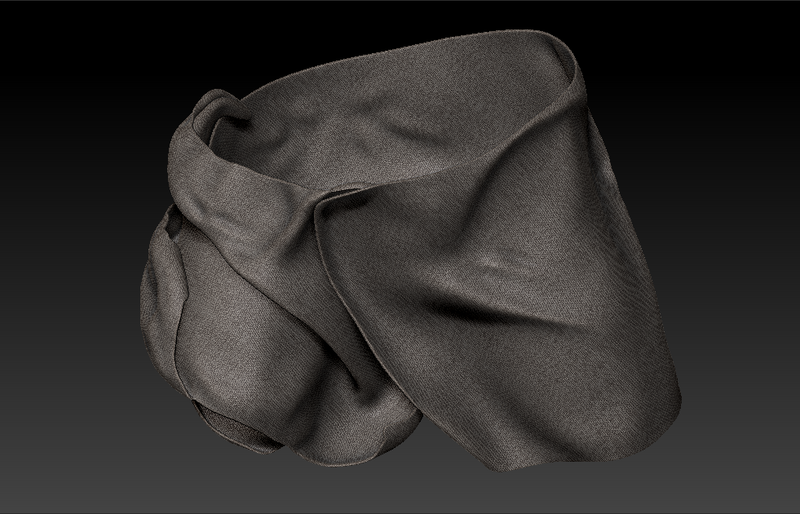 For objects such as the necklaces I use the IMM brush in Zbrush with a custom pattern. This was also done for the rope later on. 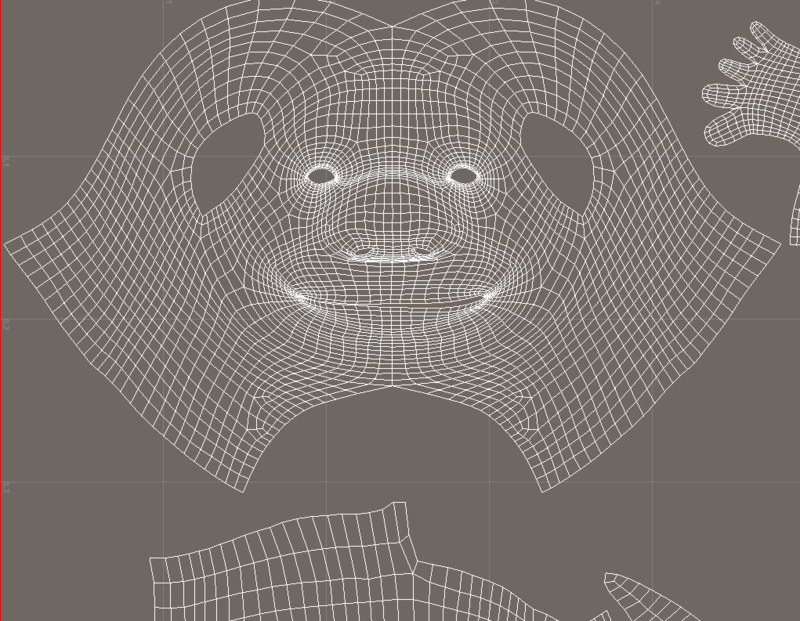 I made the teeth using polygon primitive subtools and positioned them into place. 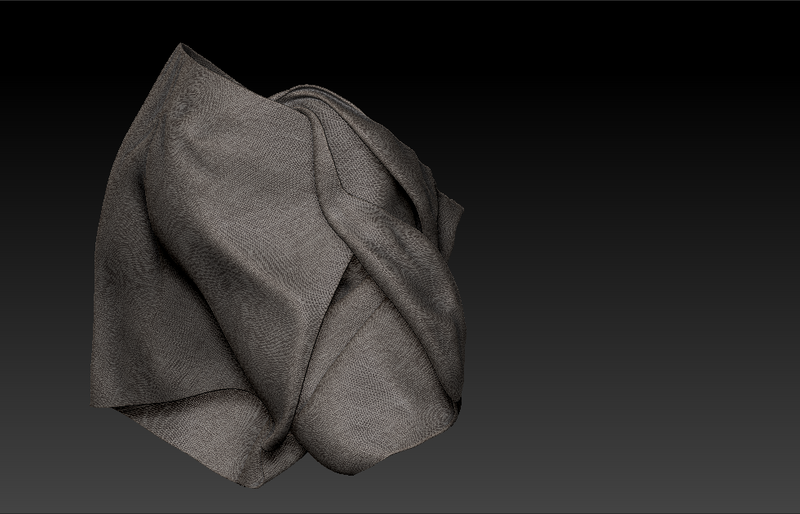 For modelling the cloth, I used Marvelous Designer 4 for the first time. 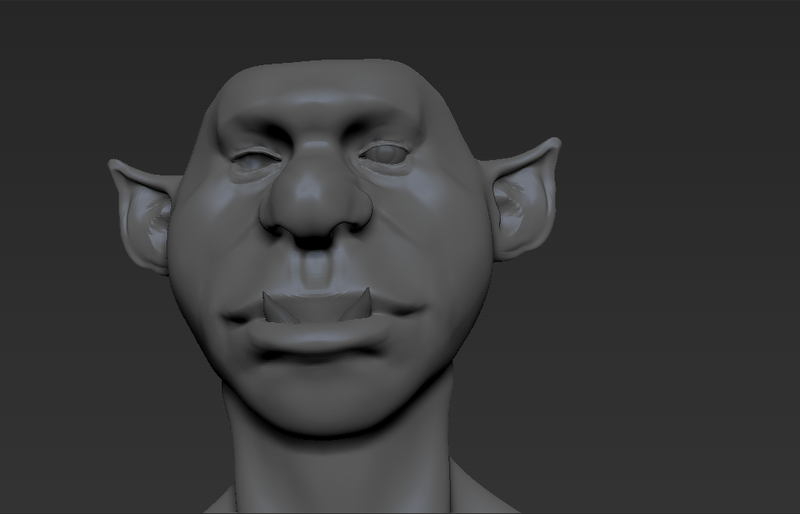 This took some getting used to but I found the software very simple to use after a little research. I simulated a flat sheet around Gerald’s body using temporary pins. 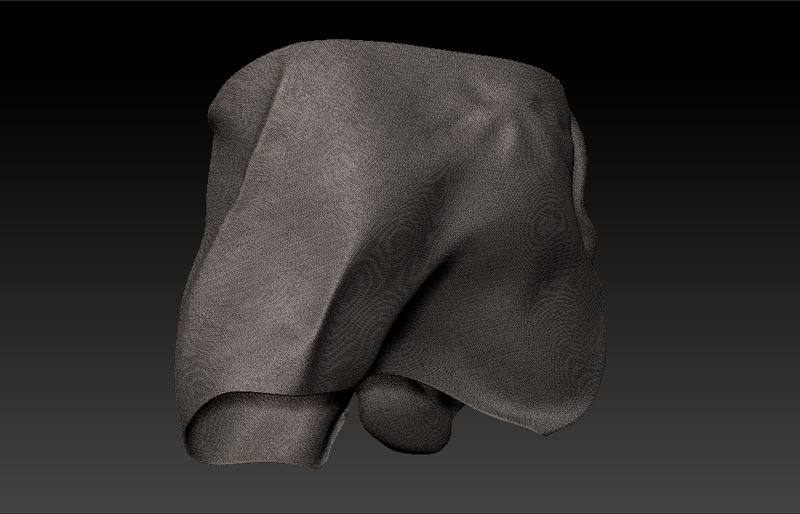 I used two pieces of cloth to create this loincloth. 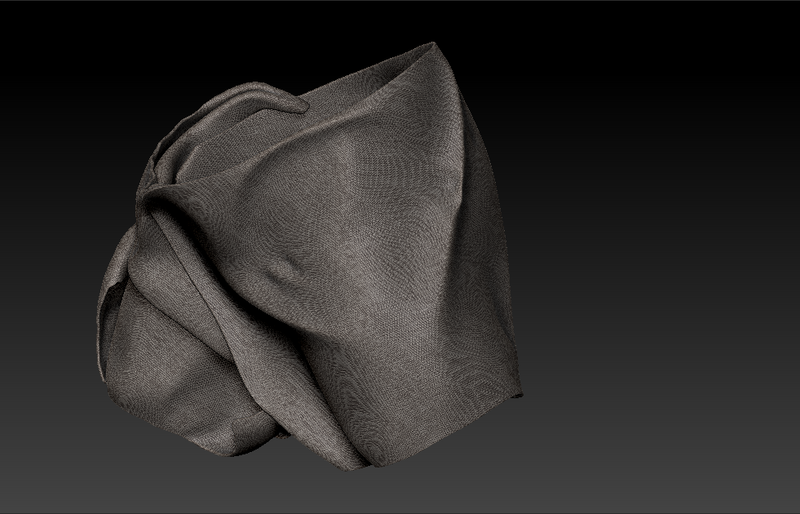 I imported the heavy mesh into Zbrush, then decimated, zRemeshed, then sculpted into the cloth to sharpen some folds and move around some forms. 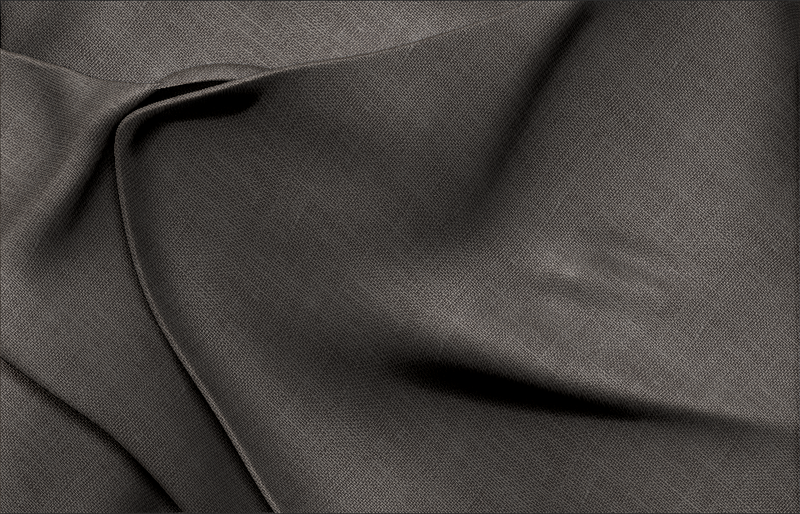 I also used NoiseMaker to create a cloth texture. 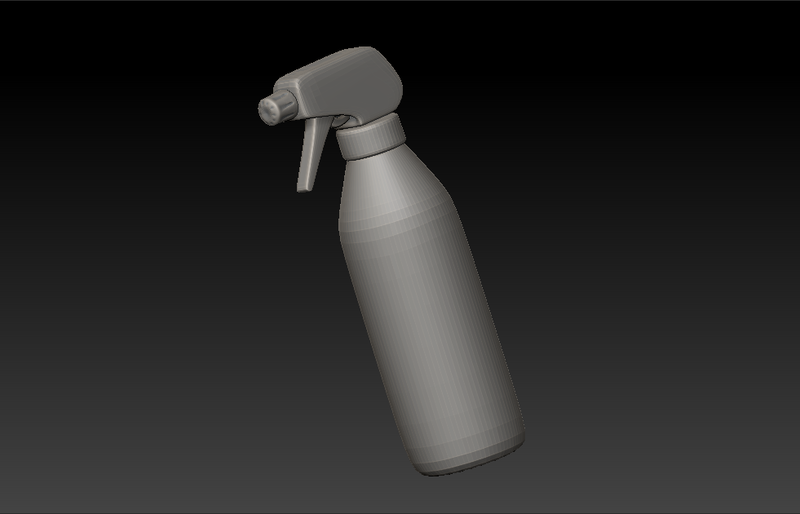 Now onto the other props. 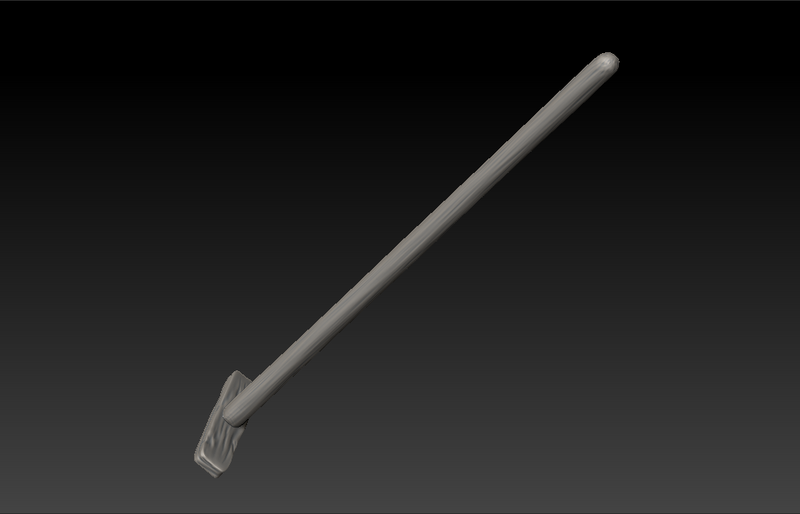 I made the broom using polygon primitives in Zbrush. 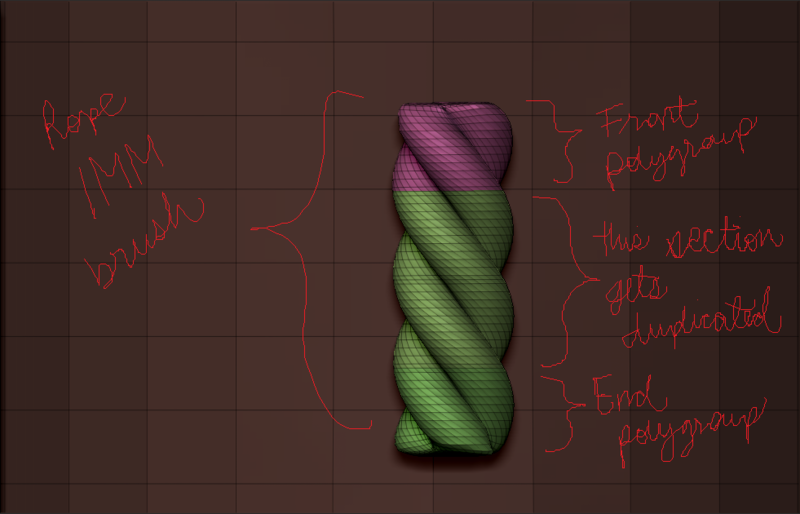 I then added some texture using NoiseMaker. 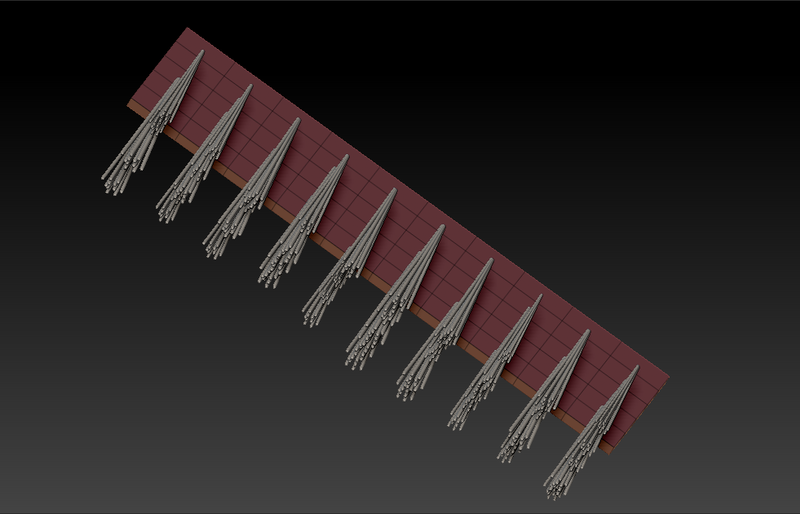 I created the bristles using NanoMesh on a plane with procedural parameters including width and height. 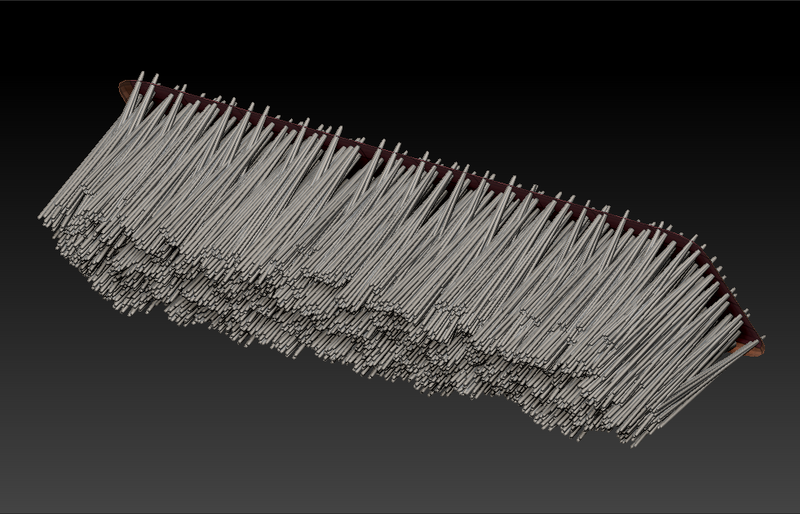 This is quite an intensive process, however, so the bristles had to be decimated heavily to retain CPU performance. I’m happy with the look of it but will look into other, less heavy solutions. 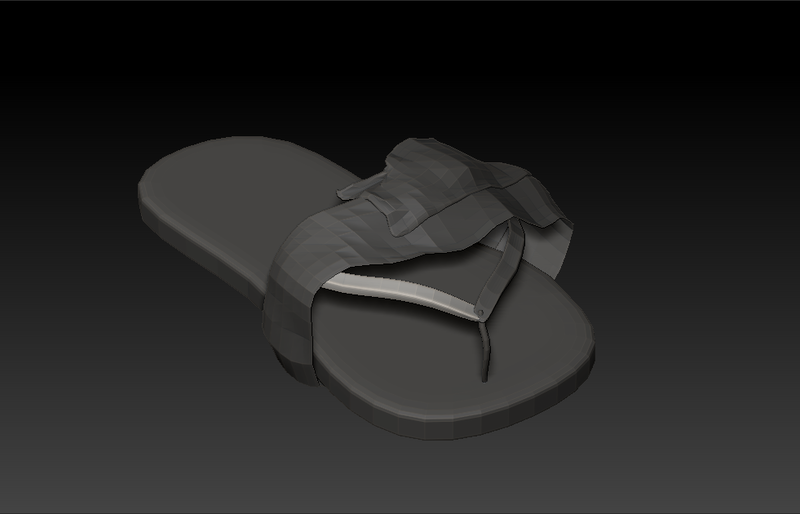 The sandals were done mostly in Maya. 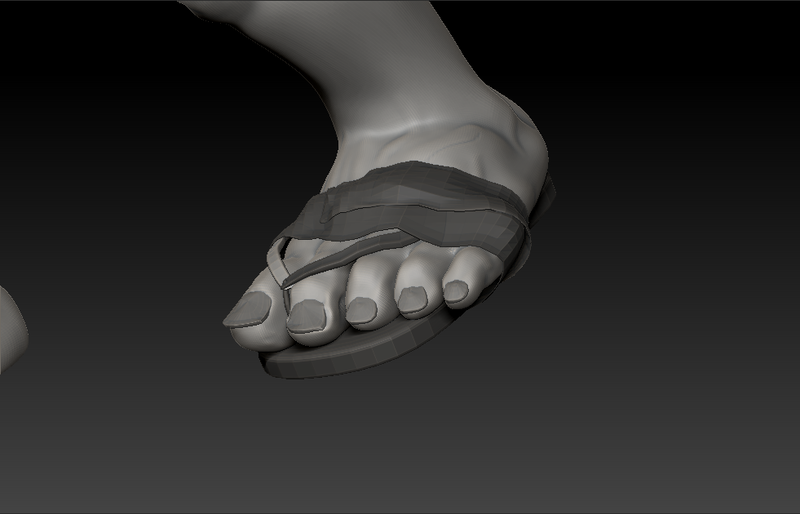 I then brought them into Zbrush to smooth and position. They’re meant to be falling apart, with some tape holding them together. 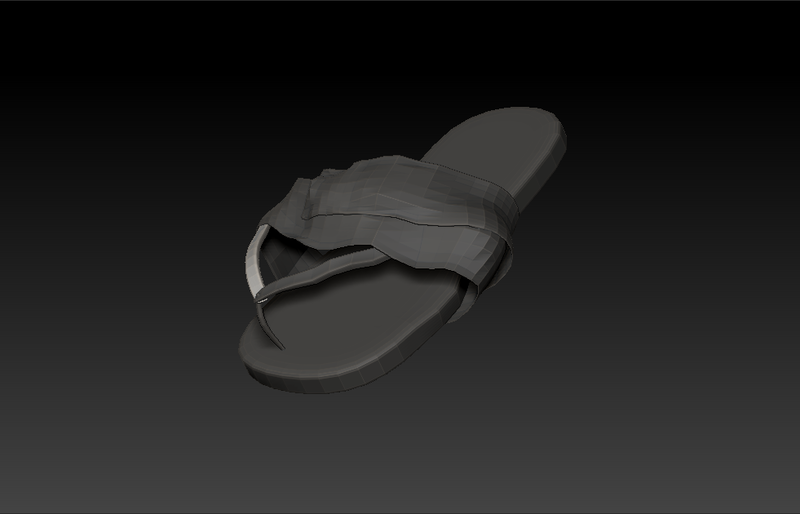 The bottle was done in the same way as the sandals. It’s meant to contain some spray cleaner, tied to his waist for convenience as he cleans. The gloves required more attention. 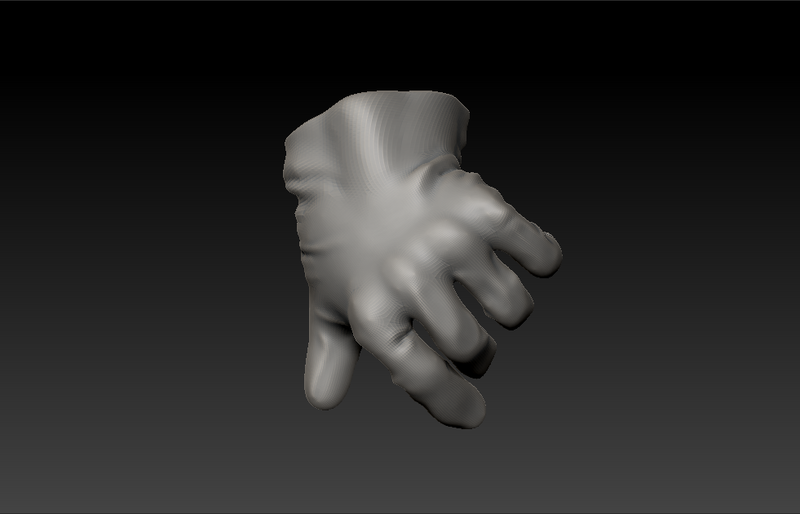 I extracted the hand mesh in Zbrush, then modelled into them. 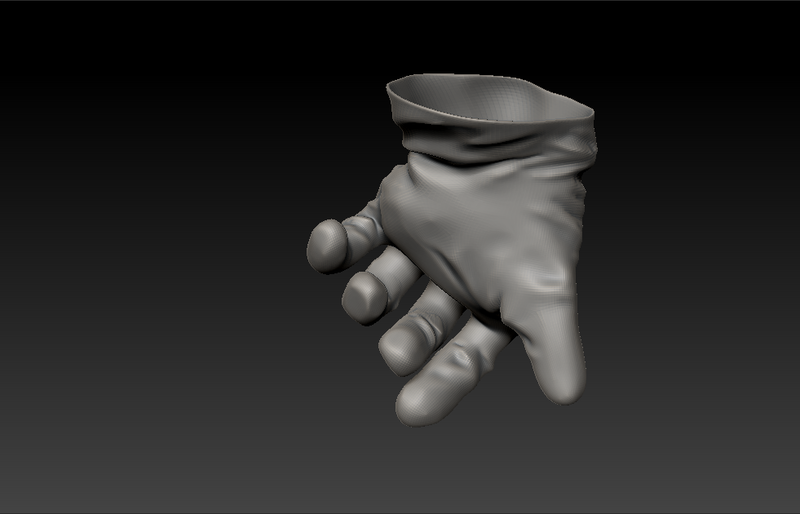 This proved quite tricky as I couldn’t quite get the rubber glove feeling when doing it from pictorial reference. So I went out and a bought a pair of gloves, then took a bunch of unflattering photos from different angles in pose. This was super effective and sped up my workflow greatly. I did this using mostly standard and dam_standard brushes. And there was have it! 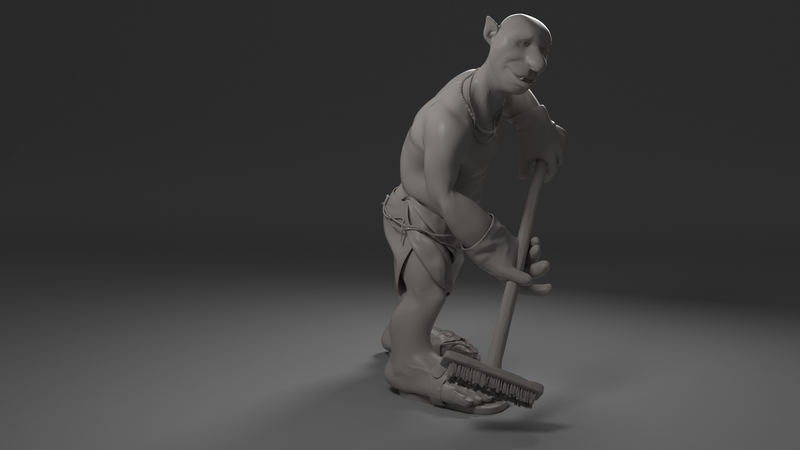 That concludes the write-up for the sculpt of Gerald the happy cleaner! 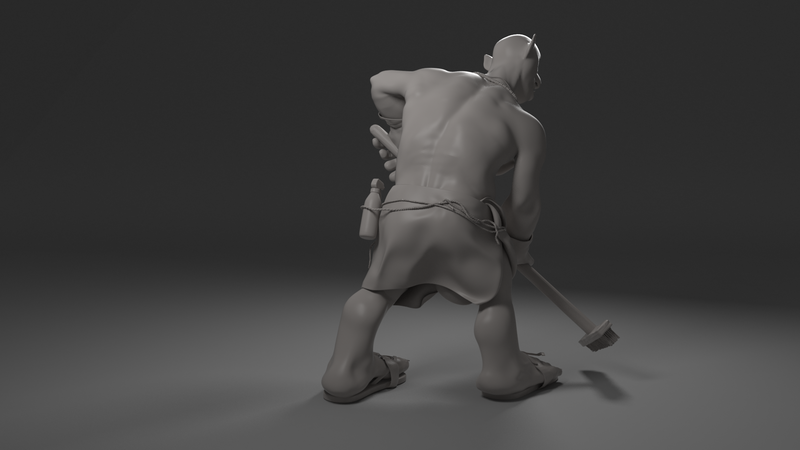 Here are some turntable renders and final shots. 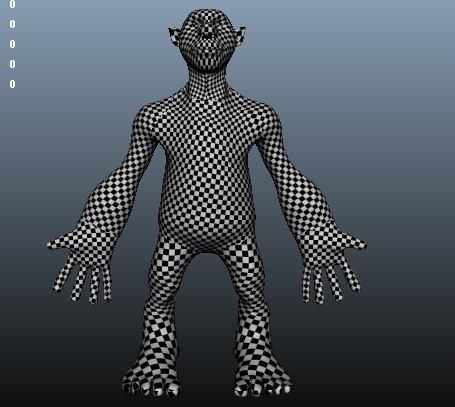 I will go on to texture him so keep a look out for that. As part of a university assignment, I created this piece. 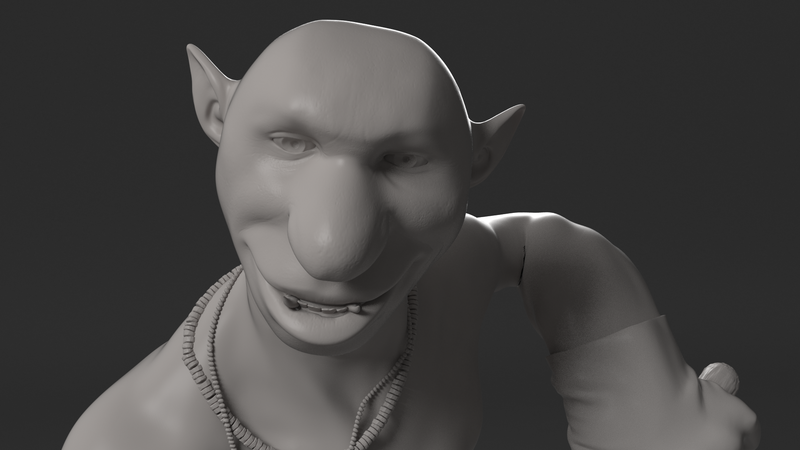 The exercise was in lighting, rendering, and compositing. Prior to this, I had barely any experience in compositing and rendering, so I found it a very educational experience. 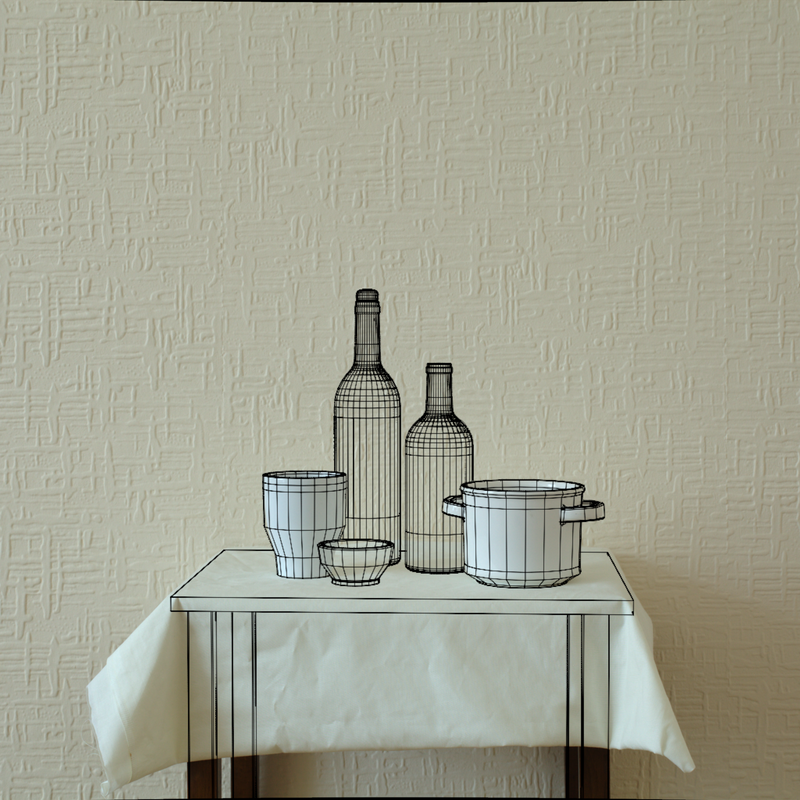 It was created in Maya, using Vray 2.0, and then comped in Nuke. 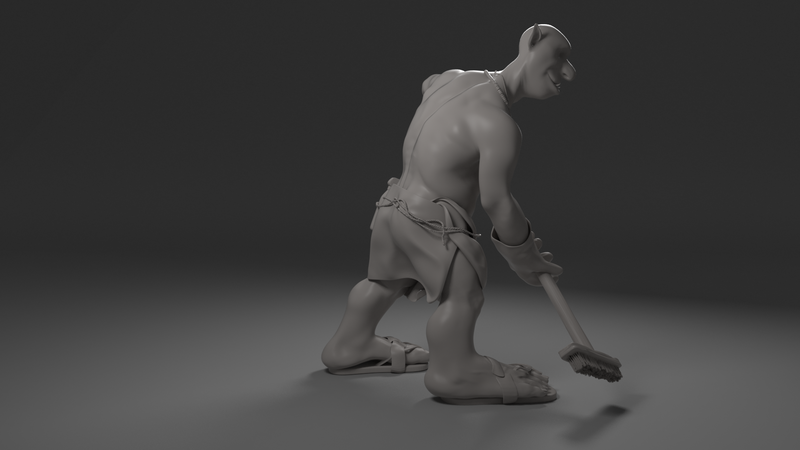 The assignment was to create a final render based on the style of a chosen artist. I chose William Brooker as I really liked his balanced and calm compositions. I photographed my backplate using the Canon 5D Mark II, a Sigma 8mm f/3.5 fisheye lens, a Canon 50mm f/1.8 lens, and VR panoramic tripod. I also used a colour checker chart, and light probe set, consisting of a white, grey, and chrome ball. 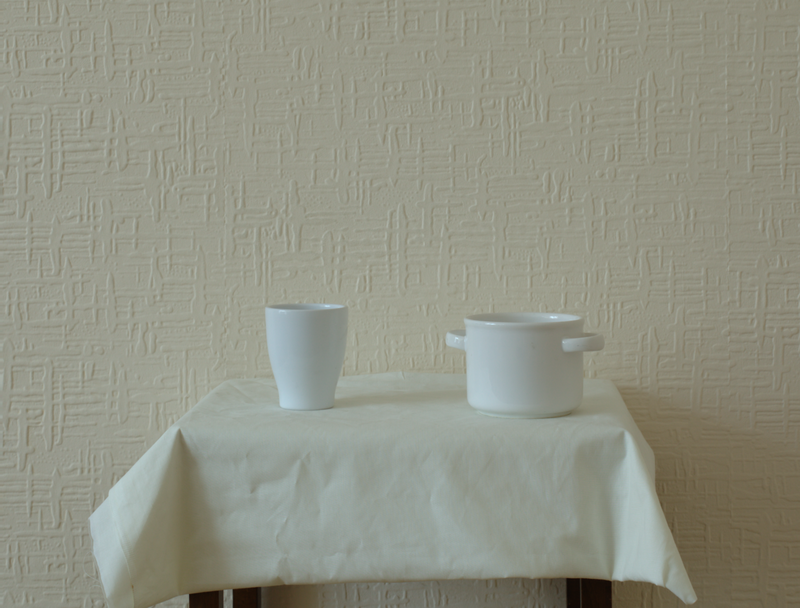 The 50mm was really good at replicating Brooker’s flat perspective style. It was a treat to use and I actually found the process really fun. I shot using the 5D’s automatic exposure bracketing to capture the HDR range for each image. The HDRI panorama was also quite a simple process. 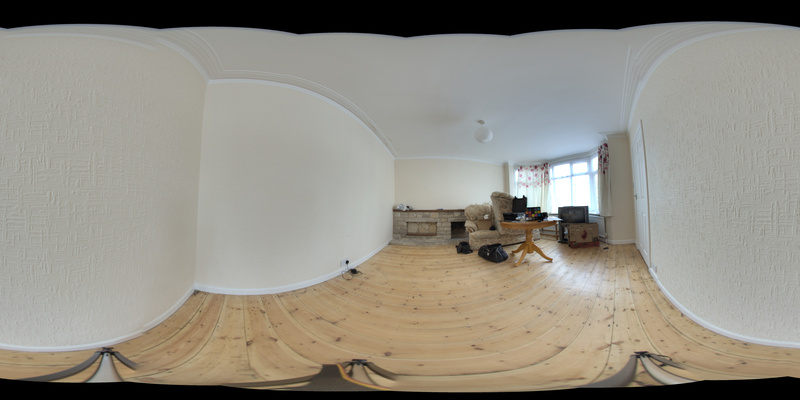 Due to the VR tripod’s incremental angle clicking feature, I could rotate the 5D at exact 60 degree angles. 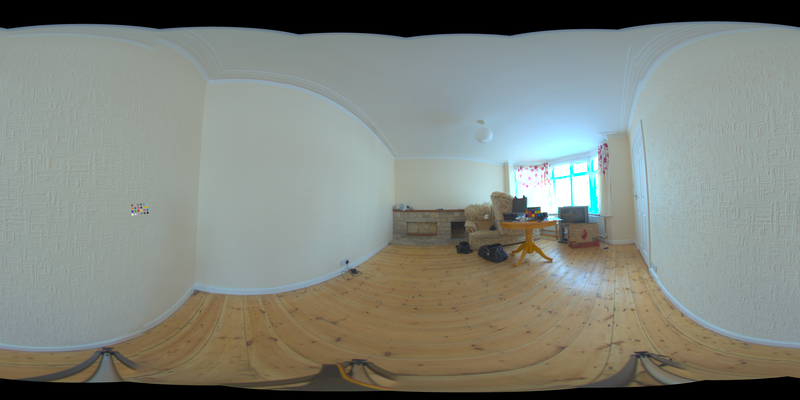 With the fisheye, this allowed me to capture the whole room very easily. The HDRI map was made using PTGUI which was crazy simple to use. Cheers guys! 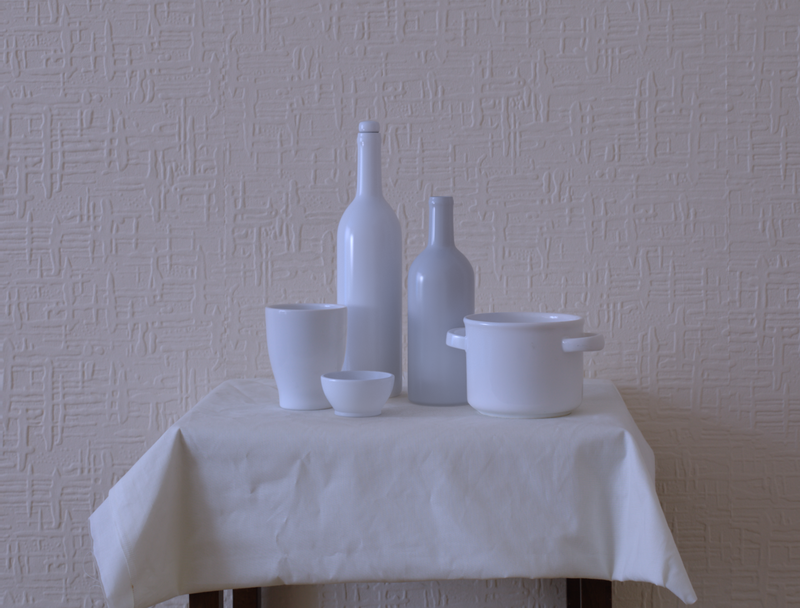 Using the colour checker chart, shot both in my HDRI and backplate, I remapped the HDRI colours to be accurate. 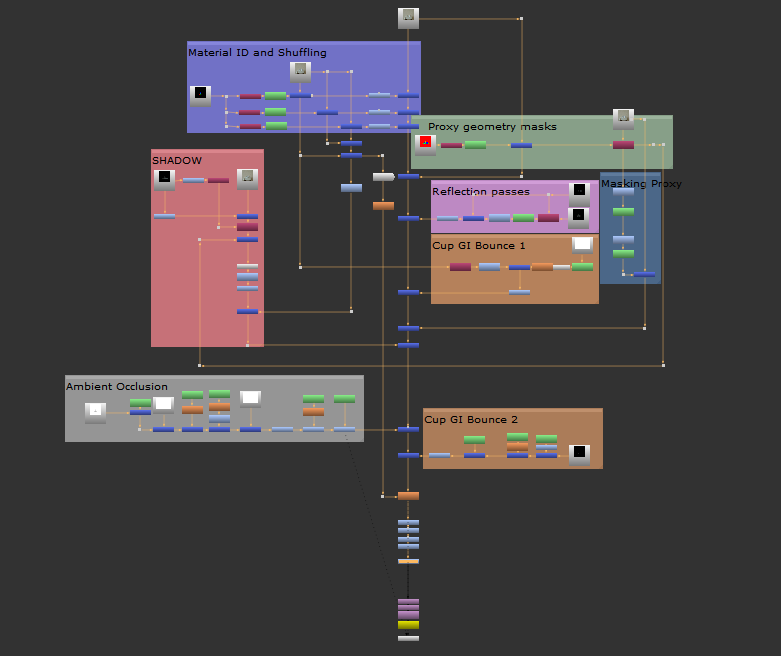 I did this using the mmColorTarget gizmo in Nuke, which was real easy to use. The initial HDRI shot. As you can see, the colours in the colour checker chart aren’t right yet. The correctly coloured HDRI map. 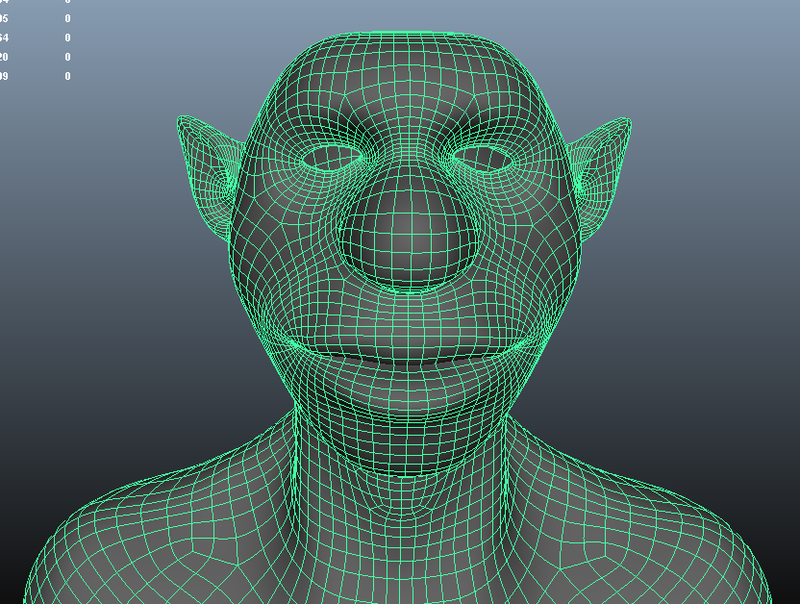 I loaded in my RAW CR2 files using UFDraw, after finding DCRAW to be not user-friendly and time consuming to use. The necessary files were then converted to 16 bit tif files. 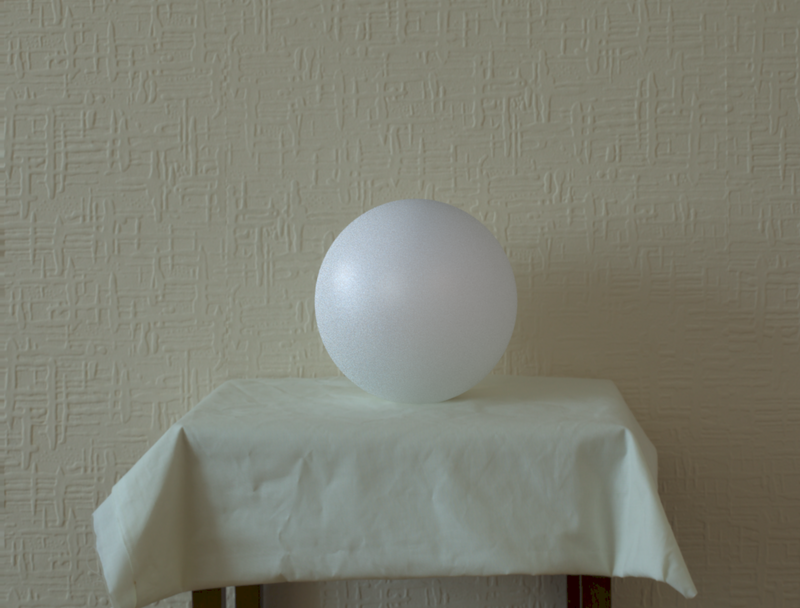 I photographed a white ball, and a chrome ball for the light match in the initial stage. 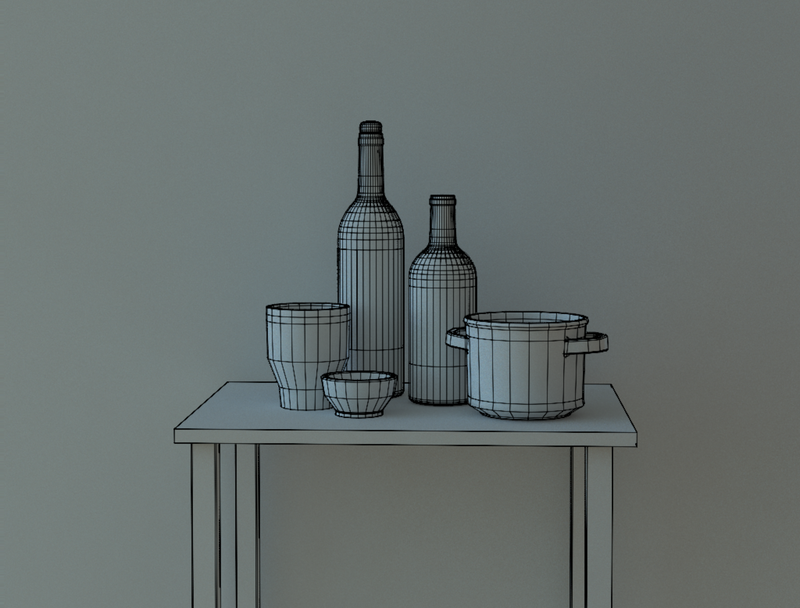 I modelled the table, proxy geometry, and cg geometry in Maya. 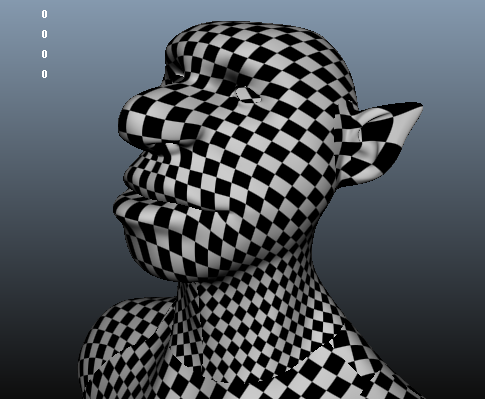 I then had to align this using my camera’s image plane as reference. This was a simple process but took some time to do exactly. 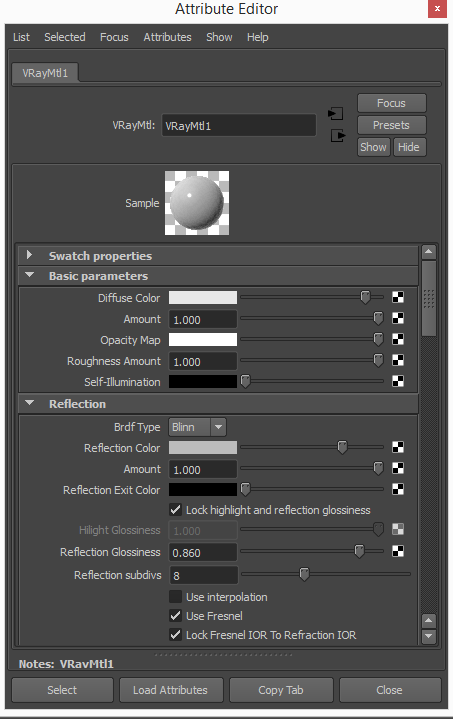 The first thing to do is change the focal length of the camera to match the real lens. So I changed mine to 50mm. 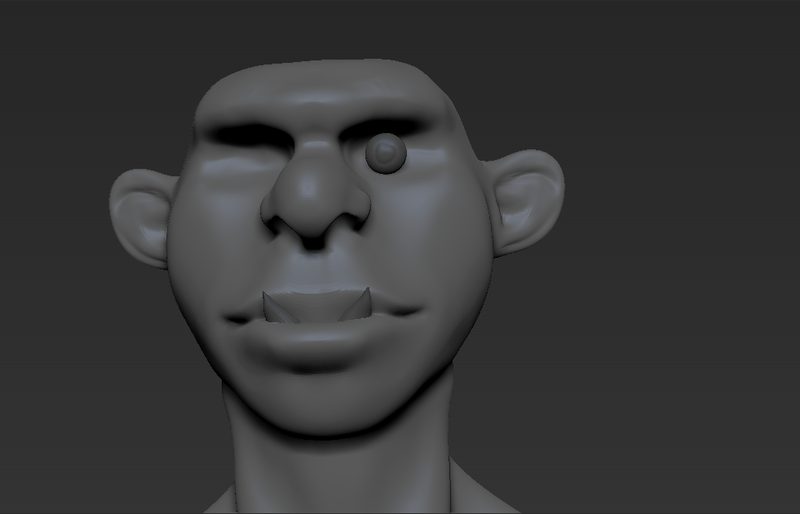 I used a technique I learnt from the head modeller at MPC , who gave a workshop on modelling at the NCCA. I grouped the camera, and locked the translation attributes. Then locked the rotation attributes of the camera itself. Using this gave me more control, and allowed me to undo camera movements if I needed to. After a little playing around, the match came pretty close. The clay renders above were taken using just the HDRI map. As you can see, this didn’t capture the lighting information completely. I used a few additional Vray rect lights to compensate. I made the porcelain material from a VrayMtl1. 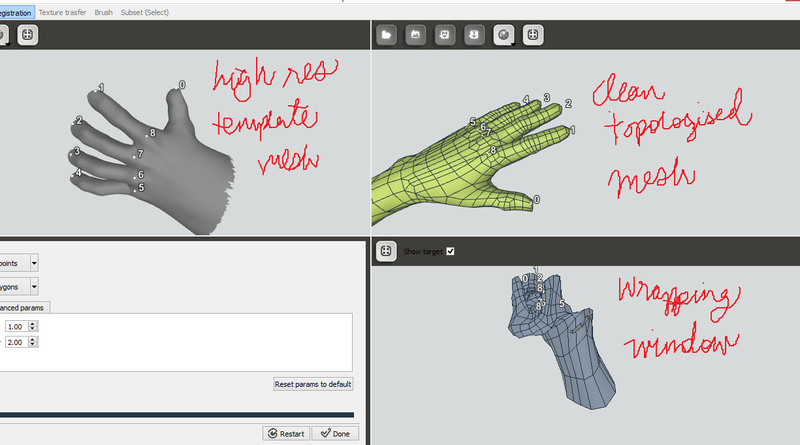 I tweaked the parameters to match the real objects. The material was quite simple but seemed to match quite well. The most important parameter in this case was the IOR which was 1.530, after Pearl which I found quite similar. I kept tweaking the reflection colour, above all to get the right specularity, and eventually moved the roughness and glossiness for the finishing touches. 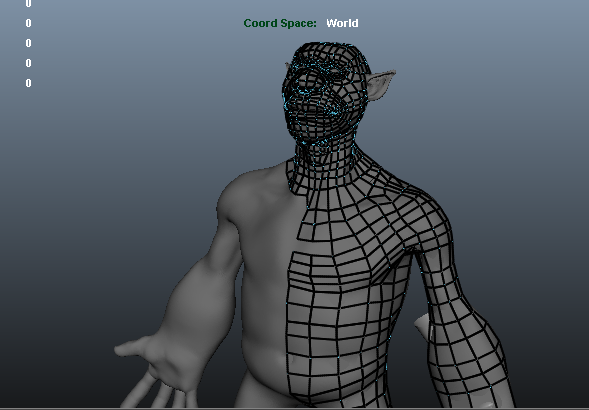 I then rendered everything in passes. This was quite difficult for me as I’d never really done this before. 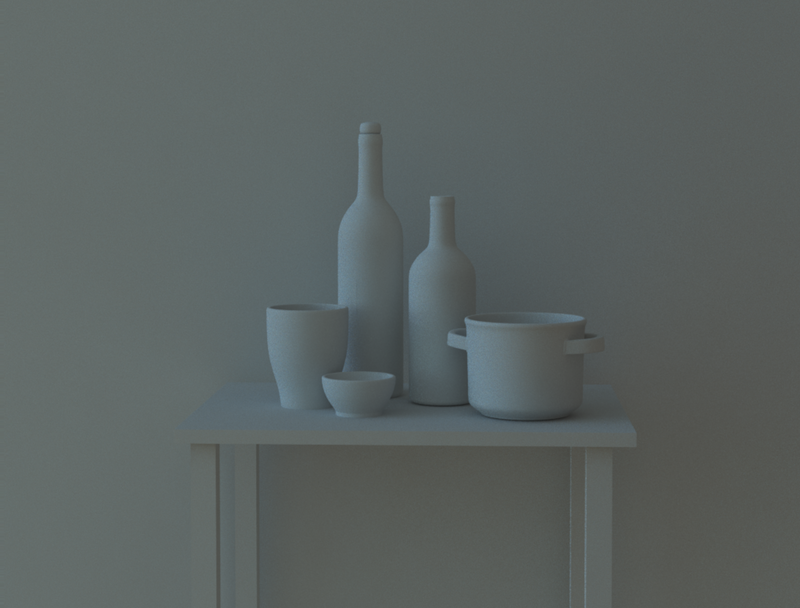 I used Vray Object Properties to separate the render elements in their render passes. 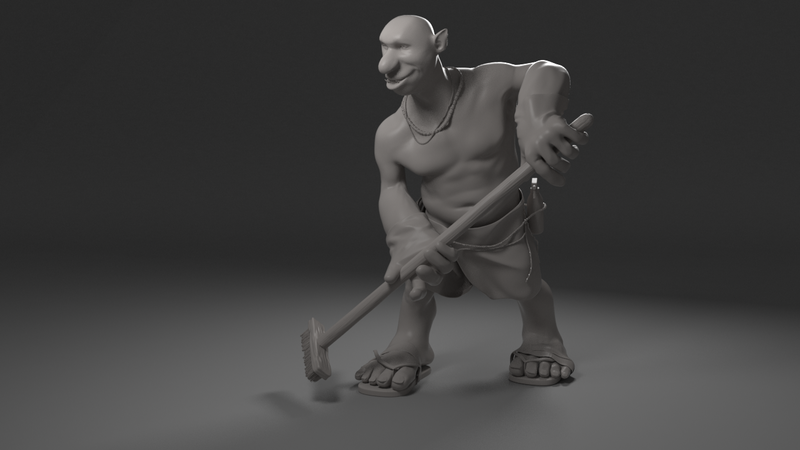 I rendered the shadows using the matte surface method. Once this was done I jumped on to Nuke. This was also quite difficult for me but through practice and logic I got through it alive. I definitely learnt a lot through this process. As you can see, the node graph was a little too complicated for its own good. But I know what I’d do different now. I used Material ID passes to separate the geometry, and used a whole lot of masking and rotos to achieve the other effects, using some passes such like with the shadows or GI bounce.